← Hey mate, let’s put a few snags on the barbie! Line 2 six hole muffin tins with muffin/cupcake papers and set aside. Into a large bowl sift the flour, sugar and baking powder then add the white chocolate chip. Stir through lightly to combine. In a separate bowl whisk together the milk, egg, melted butter and vanilla extract then pour into the dry ingredients. Mix through until just combined before adding the blueberries and mixing gently to distribute the berries through the mixture. Scoop mixture into the muffin tins to about 1/3 full making sure each muffin hole gets about the same amount of mixture so they cook evenly. Bake in the pre-heated oven for 15 – 20 minutes, until golden on top and cooked through. Be careful not to overcook as they can dry out. I change this recipe depending on what berries are in season or what I have in my freezer. You can mix berries together as well or you could use cherries. 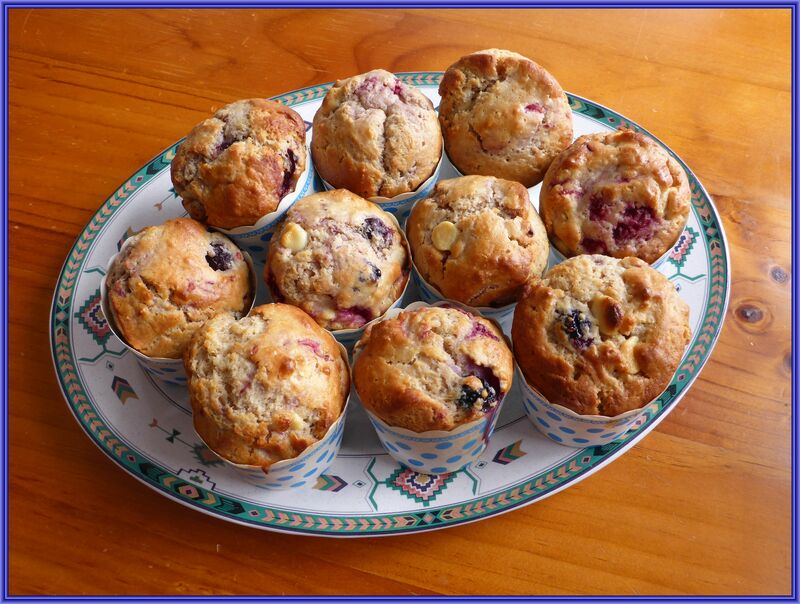 If you are cooking the muffins on two racks swap them around half way through the cooking time so they cook evenly. You could also use nuts instead of white chocolate or use normal chocolate chips depending on your taste. This entry was posted in Home, Recipes, Sweet and tagged Blueberries, Cherries, Chocolate, Muffins, Raspberries, White Chocolate. Bookmark the permalink.